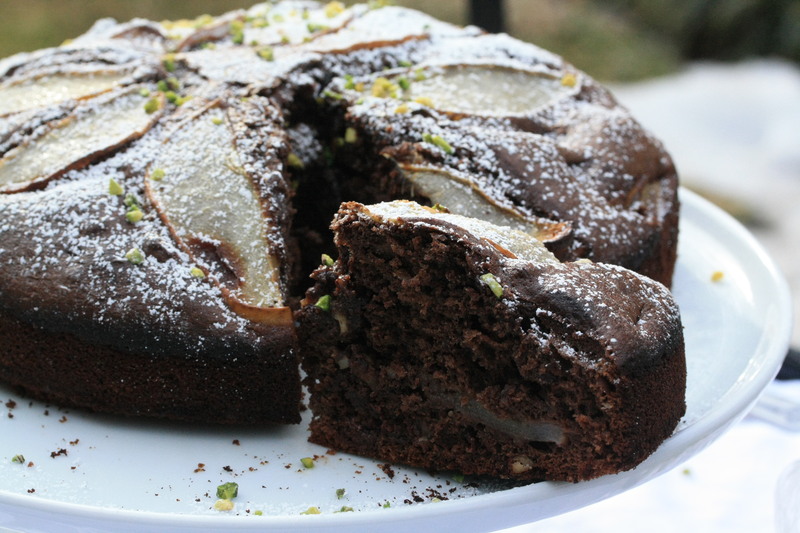 The first time I had the pear-chocolate combo in cake form was this summer in Pisa, when I had a supermarket version of it at a birthday party. Being a supermarket cake, it wasn’t anything mind-blowing. 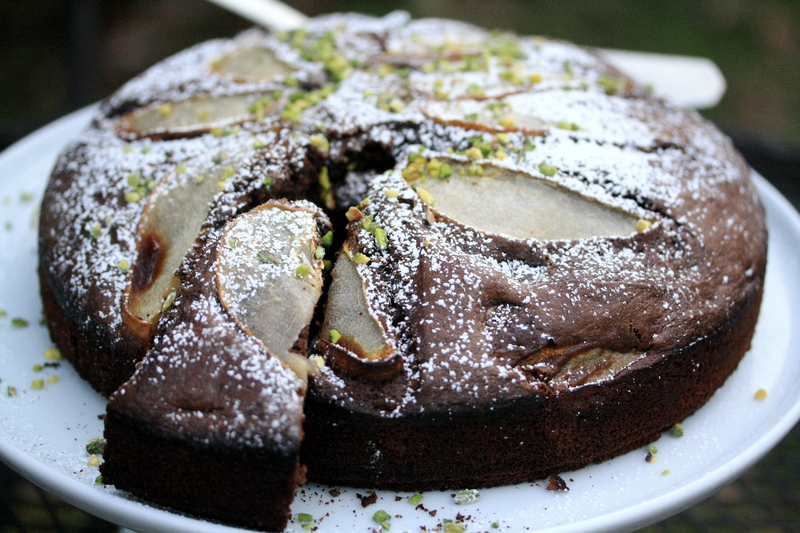 Actually, the cake was dry, the chocolate flavor was muted, and all I wanted to do was eat all the pears out of it and leave the sad cake scaffolding for the others. Since that’s not socially acceptable behavior, I resisted the urge. Apparently, it’s actually a pretty common cake in Italy. While procrastinating one day scrolling through food blogs, I came across a mouthwatering picture of this cake and bookmarked it for later. I forgot about it for a while until finally, over spring break, the opportunity came to make it. When I put together the batter and poured it into the pan, it looked like there were too many pear slices for the batter and I doubted it would grow enough to engulf all of them. It turns out, there was no reason to fear because this cake rose beautifully! I also really loved the textural contrasts provided by the crunchy hazelnuts and soft pears, and the pockets of chopped chocolate were fun to stumble upon. Because it is a rule that I can never have all the ingredients for something when I need to make it, this time I subbed blueberry kefir for the vanilla yogurt it calls for, and it ended up giving the cake a diffuse blueberry aroma that I actually really liked. But next time, I’ll probably use vanilla yogurt. This cake is perfect for when you have guests for lunch or dinner, and it isn’t too sweet so it works for breakfast as well. The small amount we had left after dinner was even better the next day, when the pears had softened a bit more and the cake had acquired a sticky, moist crumb. Adapted and translated from the blog Arte in Cucina. Roughly chop the hazelnuts and the chocolate and set aside. Preheat the oven to 350 degrees F and grease a spring form cake pan. Peel and slice the pears into thin slices. Beat the eggs with the sugar until the mixture is light and fluffy. Mix together the flour, cocoa powder, and baking powder and add to the egg mixture one spoonful at a time, mixing as you add. Then add the oil, yogurt, hazelnuts, and chopped chocolate. Mix until it is homogeneous. Pour half of the batter into your pan, layer it with as many pear slices as you can fit, then cover with the rest of the batter. Decorate the top with more pear slices. Bake for about 40 minutes, and enjoy! 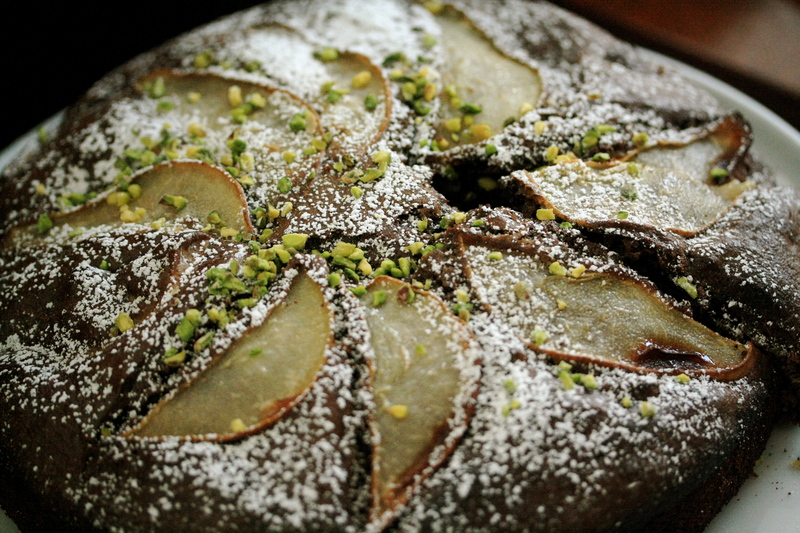 PS: I decorated it with chopped pistachios and powdered sugar, just for looks.